Laurine German of South Portland stands in the batter's box for the UMaine softball team in this May 2018 file photo. 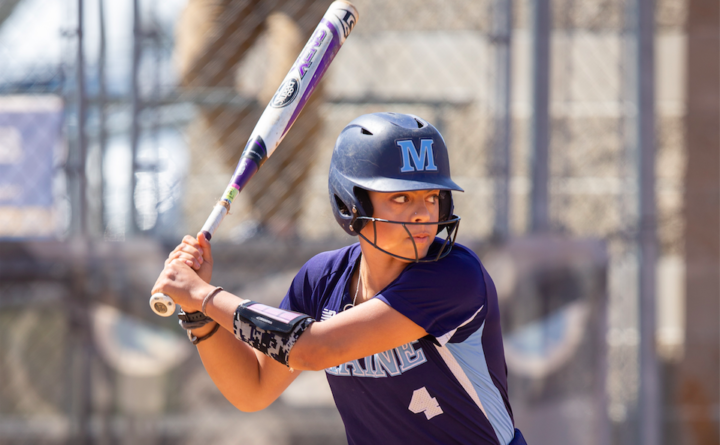 The University of Maine’s softball team will play five schools that amassed at least 30 wins last season during the nonconference portion of its schedule leading up to America East play. The Black Bears are coming off a 22-25 season, 9-7 in conference play, and will have a 10-member freshman class that will help to replace eight players who graduated. Mike Coutts’ Black Bears went 2-2 in the AE Tournament, which was won by Albany for the second straight year. UMaine, which won the tourney in 2016, lost in the finals to Albany in 2017. The Black Bears’ 2019 schedule will see them travel to Texas, Kansas and Tennessee for games against 14 different teams before they return to the northeast for four games against four different opponents at Central Connecticut State on March 23-24. UMaine will open its season in Beaumont, Texas, for a noon game against the University of Texas San Antonio on Friday, Feb. 22. UTSA was 20-30 a year ago. They will play Lamar (28-28) later that day (7:30 p.m.) and will take on Lamar again the next day at 4:30 p.m. before facing UTSA two hours later. The next day, they will face the University of Rhode Island (12-35) in Beaumont. The Black Bears will move on to Abilene, Texas, for a pair of doubleheaders against Abilene Christian (23-26) on March 1 and 2. The following weekend, March 8-10, UMaine will head to Lawrence, Kansas, where it will play two games apiece against the University of Missouri-Kansas City (15-41) and the University of Kansas (27-25) before concluding the trip against Southeast Missouri State (33-20). UMaine will be in Tennessee from March 16 to 21. Its first stop will be Memphis where it will take on the University of North Alabama, a first-year Division I program after going 46-17 in Division II last year; Memphis (37-21), Texas Tech (31-28) and Murray State (16-36). UMaine will then move on to Nashville for games from March 19-21 against Tennessee State (4-48), a doubleheader against Belmont (25-25) and a single game with Middle Tennessee (39-22). Then the Black Bears head to Central Connecticut State for games against Rider University (17-33) and Siena College (18-26) on March 23, and ones with Manhattan College (28-25) and Iona College (19-27) the next day. UMaine will begin America East play with three games at UMass Lowell on March 30 and 31, and will play its home-opening three-game set against Hartford on April 13 and 14. Boston University softball coach Ashley Waters, who was inducted into the University of Maine Sports Hall of Fame in 2017, has received a contract extension from the school after leading the Terriers to school-record 39 wins last spring. Waters has led the Terriers to two Patriot League championships and two NCAA Tournament berths over the past three seasons. She was the Patriot League and ECAC Coach of the Year last season. Her Terriers upset No. 1 Oklahoma 4-3 last February, the first time a New England region team had ever beaten a No. 1 team. They went on to play in the NCAA Regionals where they lost to Oklahoma and Missouri. Waters, a native of Amesbury, Massachusetts, hit .323 during her four-year career at UMaine with 41 doubles, 11 triples, 18 homers and 100 runs-batted in. She scored 134 runs. She was a two-time America East first team selection, an All-Rookie team pick and the 2008 America East Player of the Year. She was on the Northeast All-Region team in 2009, her senior year. “We could not be happier with the job Ashley has done in three short seasons. Her passion for building hard working and successful teams is matched by the care she has for her student-athletes’ well-being,” BU athletic director Drew Marrochello said in a press release. “It is a privilege to work at one of the best institutions in the entire country with these incredible young women in a sport I love,” Waters said in the release.